2 days old full term and normally delivered male neonate with severe skin laxity. 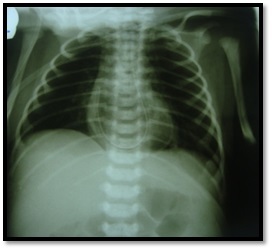 He admitted in NICU for degrees of respiratory distress and none bilious vomiting (Figure 1). He had facial features aged appearance. His skin was lax elsewhere and had a hoarse cry. Increased hip joints laxity was seen. He had normal bowel movement. Physical examination revealed slightly tachypnea (respiratory rates=30-40 per minute).Other sites had no problem. Arterial blood gas and electrolytes were normal .NGT was inserted for gastric decompression and then we requested for him Thoraco-abdominal X-ray (Figure 2). He underwent surgery. 2 days after surgery he had bowel normal movement, and feeding was started and tolerated, but 3 days later he demonstrated abdominal distention ,bilious vomiting ,and did not tolerate feeding. 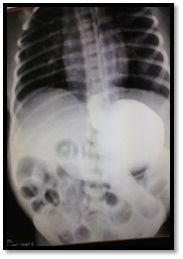 Abdominal ultrasound revealed only bowel distention. Contrast study with oral gastrographin was done. (figure 3).He re–operated for obstruction.